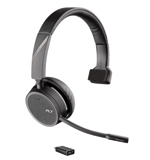 Plantronics Voyager 4210 Bluetooth Mono USB wireless headset with BT600 USB-A Bluetooth adapter (class 1). Plantronics Voyager 4210 USB Bluetooth headset is a "single" ear headset. It has a noise-canceling mic to block unwanted office chatter and noise so your listeners don't hear the office noise. Class 1 Bluetooth allow up to100 feet of range when used with the Bluetooth BT-600 adapter (included). With other Bluetooth devices, you only get 30ft. compatible with PC or Apple Mac or any mobile device or tablet.